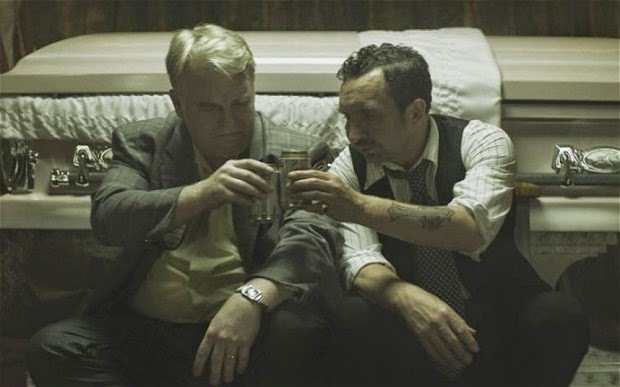 This is a film that wasn't meant to bear the sudden and shocking realisation that we have fewer Philip Seymour Hoffman performances in front of us than we have behind us. As the first major release to star the late, great actor since his untimely death in February, it's a weight that God's Pocket must carry all the same, but as a film that's indubitably an actors' film, it does find him in his element. Hoffman plays Mickey, a van driver who lives in the one-van town of God's Pocket, Philadelphia, home to a bunch of fiercely parochial locals who aren't averse to a little criminality on the side. When Mickey's obnoxious stepson Leon dies while working at a construction site, the other builders on the site close ranks around the truth about what really happened. Mickey's distraught wife Jeanie is convinced there's more to it and she ropes in alcoholic local columnist Richard Shellburn to find the truth, but Mickey is more concerned about how he's going to pay for the imminent funeral. It's a difficult film to like, given how abruptly and repeatedly it ratchets between family drama, dark comedy and brutal violence. The script is bookended by select quotes about the town from Shellburn's columns, (narrated by a toxic Richard Jenkins) specifically about the men who live, work and die there. Many of the characters seem ignorantly happy in their booze soaked squalor, but Mickey and Shellburn are at least matched in having moved to the town and gradually building twin desires to get the hell out. 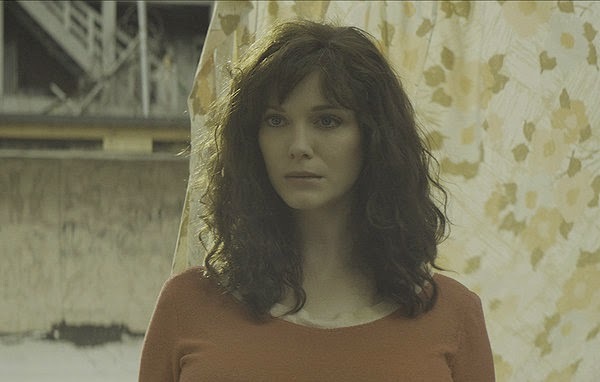 As lensed by cinematographer Lance Acord, the town is an utter shithole in which every primary colour jumps out as distinctive against the grey and the beige. The film begins at Leon's funeral and then expounds the three days leading up to it, starting with Mickey as a stand-up guy and loving husband and stepfather, and Shellburn enjoying some local celebrity for his cod-insightful columns about working class heroes. Both fall from grace to some extent in the following days and neither of them have a good time of it- at times, the pile-up of embarrassment and misfortune resembles nothing so much as a blue-collar take on the Coens' A Serious Man. While the script isn't up to the Coen standard to which it obviously aspires, it's evidenct that co-writer and director John Slattery capitalised upon the uplift that comes with actors directing actors and manages his ensemble incredibly well. Chief amongst his canny choices is a near perfect deployment of his Mad Men co-star Christina Hendricks' sensuous persona, perhaps the best we've yet seen in a film, as Jeanie, the platonic ideal of feminine sexuality who wakes Shellburn out of his alcoholic stupor. But aside from the obvious, she gives a heart-wrenching performance as a bereaved mother and winds up being one of the understated highlights of the film. 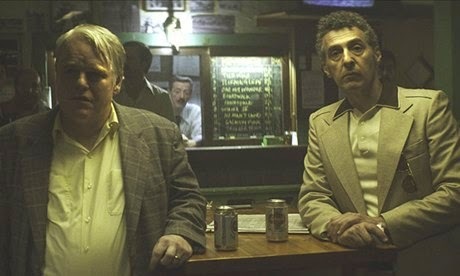 Other highlights include Eddie Marsan as an unctuous undertaker who coaxes and bullies Mickey to buy his most expensive coffin, John Turturro as Mickey's gambling best mate and Caleb Landry Jones in a brief but memorable turn as Leon, a loud-mouthed dipshit who scarcely makes it as far as he does without someone else thumping him. The shuddering gear changes mean that the script is never short of incident to which these actors can react, but the piddling consequence is that it never entirely finds its rhythm, and is once too often given over to shocking or farcical setpieces instead. God's Pocket stands up admirably to a level of scrutiny which was surely never intended, not least because Hoffman was never less than excellent. John Slattery's directorial debut wears its macho cinematic influences on its sleeve, to where it feels like this was probably a more distinctive tale on the page than on the screen. The story itself is slight, but the characters are involving even in their oppressive close-mindedness. Finally, the star-studded ensemble cast and the drippingly grimy cinematography make this an involving if minor dark comedy. God's Pocket is now showing at selected cinemas nationwide, and will be released on DVD, Blu-ray and video on-demand services on December 26th.